Few countries have as many islands as Greece. It’s often called “the Greek islands,” as if the country’s archipelago of 6,000 are all the same, but experienced travelers and repeat visitors—of which there are many—can immediately sense the nuances of each one. After all, the Greek islands are spread across an area of 51,000 square miles and encompass a variety of climates and topography. 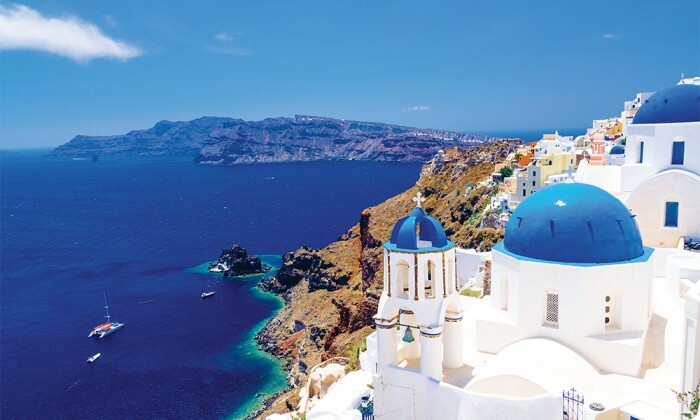 Though the country looks comparatively small on a map, all those islands combined give Greece more than 9,000 miles of coastline (the tenth-longest coastline in the world) and no shortage of islands to suit any taste or preference. The fun is in finding a favorite. 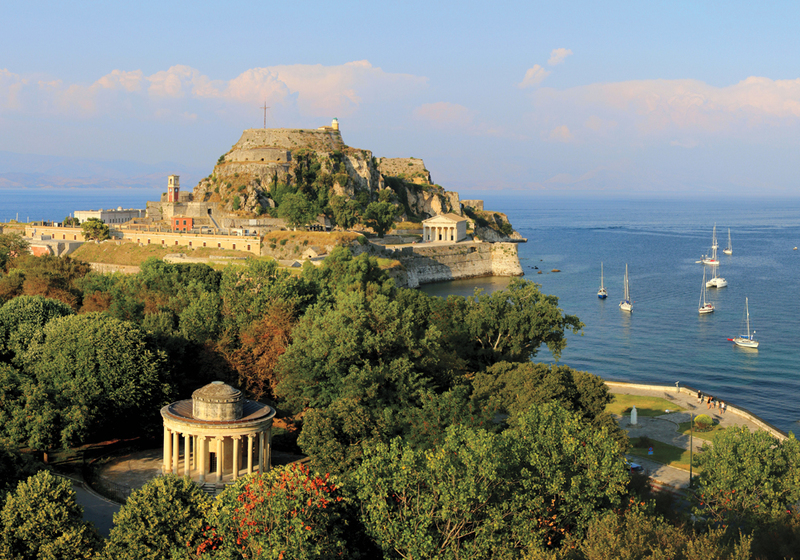 Steeped in history, Corfu attracts sophisticated travelers. Corfu, one of Greece’s northernmost Ionian islands, was the first to become a vacation spot in an era when travel for recreational purposes was a privilege of the elite. Located off the northwestern reaches of the Greek mainland, Corfu (Kerkyra in Greek) is a forested island whose varied topography and exotic scenery attracted the attention of a number of European royalty and members of high society. As in so many other places located at the crossroads of trade, Corfu’s position in the southern Adriatic Sea made it a coveted piece of real estate, especially during the height of the Venetian maritime empire. For most of the 19th century, Corfu belonged to the United Kingdom. As in other parts of Europe, the advent of modern-day tourism on Corfu can be attributed to British travelers who sought to spend extended periods of time in drier, sunnier climates than those found in Great Britain. In contrast to the popularity of the Greek islands as places to enjoy nature, Corfu complements its beaches and scenery with a rich repository of cultural assets that traditionally attract a more intellectual set of visitors than party islands elsewhere in the country. These sights include such fine museums as the Antivouniotissa Museum of Byzantine Art and the somewhat unexpected Corfu Museum of Asian Art housed in the beautiful Palace of Saint Michael and Saint George. Vestiges of Venice are still part of modern Corfu in the language and cuisine as well as the architecture. Though many irreplaceable buildings were destroyed in WWII bombing raids, one grand structure that did survive is the Achilleion, the palace of beloved Austrian Empress Elisabeth of Bavaria, better known to the world as Sisi. Located six miles from Corfu town on a hill above the small town of Gastouri, the Achilleion was commissioned by Empress Elisabeth in 1890 as an escape from several family tragedies that took their toll on her emotional state, most harrowing among them the death of her only son in 1889. The palace is now a museum owned by the Greek government. The ultra-exclusive Navagio Beach is only accessible by boat. A few islands south of Corfu is Zante (Zakynthos), which shares Corfu’s Venetian heritage. What Zante has all to itself is Navagio Beach, one of the most dramatically beautiful beaches in the world. Though accessible only by boat, Navagio (which means shipwreck) is not exactly undiscovered but its astonishing setting on the island’s northwestern coast makes up for any effort to get there. Zante’s many historic churches and monasteries are an important component to the island’s cultural patrimony. The St. Dionysios Church complex located right on the waterfront of Zakynthos town is one of the most impressive. Just next to Zante on the Ionian island of Kefalonia is the enchanting Myrtos beach, one of the most beautiful in all of Greece. It’s a thin strip of sand backed by a high cliff, famous for the beautiful colors of its water, which change from the greens and blues of daytime light into a spectrum of red, purple and gold at sunset. 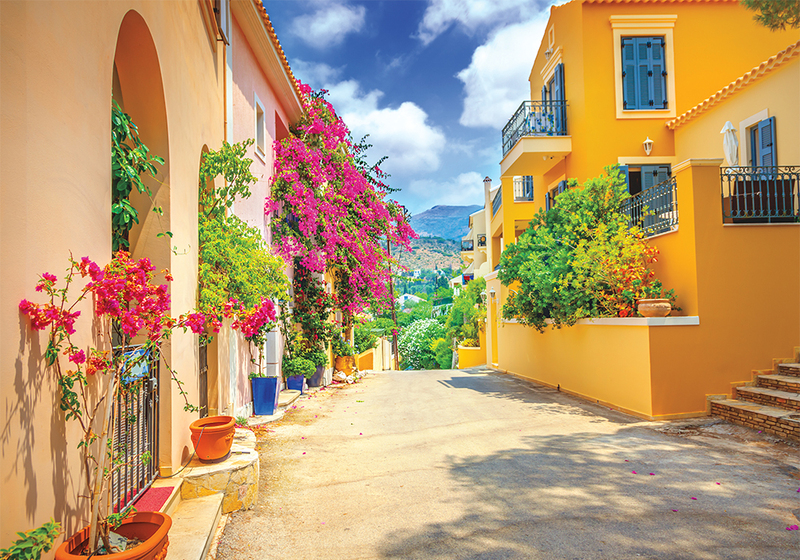 Colorful streets abound on Kefalonia. In the eastern Aegean, the island of Samos was one of the most important in ancient Greece. The rich and powerful city-state located less than two miles from the Turkish coast was the home of famed mathematician Pythagoras, as well as the philosopher Epicurus, whose thoughts on pleasure have been applied to the enjoyment of food in particular. 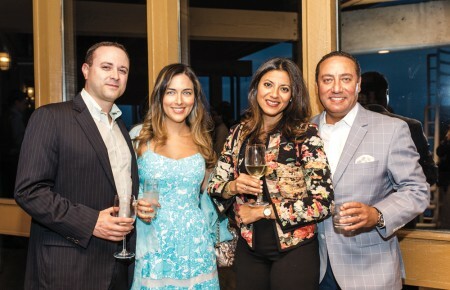 This association with food perhaps stems from the island’s abundance in exceptional produce such as figs, grapes, olives, almonds and honey mixed any number of ways to create irresistible dishes, especially desserts. Samothrace’s steep peaks, pebbly beaches and rivers are said to have healing properties. Vathy is the capital of Samos. It’s a scenic town of red roofs set on a natural harbor backed by the arid green mountains for which the Greek islands are well known. Also renowned is the Tunnel of Eupalinos, a UNESCO World Heritage site that’s considered a masterpiece of engineering of the ancient world. Designed to be an underground aqueduct to supply the capital with fresh water, the Tunnel of Eupalinos carried water more than half a mile through the rock of Mount Kastro in a manner undetected by enemies, who often cut water supplies as an offensive strategy. But the appeal of Samos is not all in its antiquities. The island is one of the most agreeable in Greece. The food is as delicious as it was in the time of Epicurus, and the pretty villages of Marathokampos and Karlovasi present appealing opportunities to enjoy village life in an unhurried manner. In contrast to the expected ancient ruins, Karlovasi is unusual in its architectural patrimony in that it is home to many fine Neoclassical mansions and other buildings from the early 1900s constructed during the town’s era as a manufacturing center that brought great wealth to the area. The largest of the Greek islands, Crete (Kriti) is a vast landmass rich in archeological history reflecting its strategic value to sundry Mediterranean civilizations. As the most populous of Greece’s islands, Crete plays an important role in the national economy. One of the reasons is the island’s dual climate, running parallel to each other on either side of a horizontal mountain range. To the north of the mountains is the humid, temperate climate of Europe. To the south, the drier and hotter climate of North Africa, which allows southern Crete to produce agricultural products year-round (in greenhouses) rather than only in the summer season. Though Crete is very busy as a destination for Greeks and other Europeans, not many people venture past top attractions like The Heraklion Archaeological Museum or The Palace of Knossos just outside the city. But the island maintains its own cultural traditions. For those who make their way to Ierapetra, called the southernmost town in Europe, there is a palpable feeling of being at the end of the continent, even if already on an island. Ierapetra’s Old Town is known as Kato Mera and retains the historical feel of a small village. It is in this part of the city where the old mosque and the so-called House of Napoleon, where the French emperor stayed with a local family, are located. Ierapetra’s Museum of Antiquities showcases a collection highlighting the seafaring Minoan civilization that first inhabited Crete more than 4,000 years ago. The islands of Greece can be reached by public ferries, but it is obviously more efficient for visitors with limited time to enjoy the luxury of a cruise aboard a small ship or private yacht to avoid arriving on a tiny island with a 1,000 of your maybe not best friends. 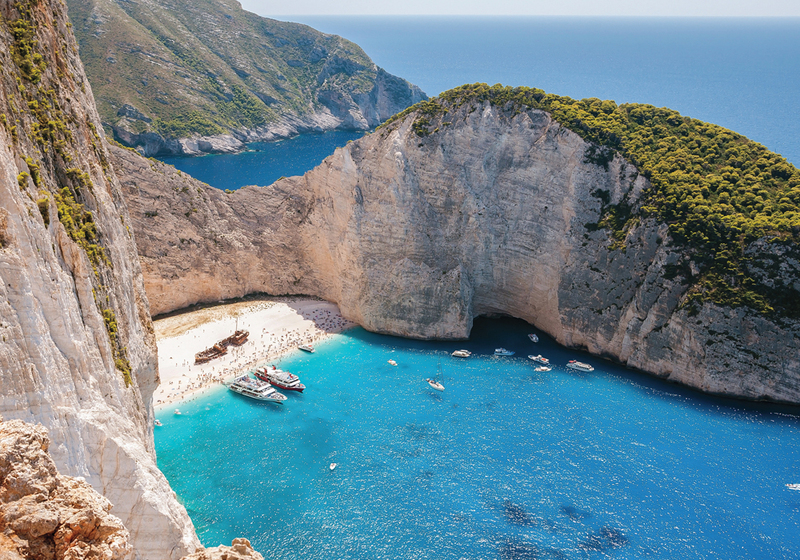 Virtually every major cruise company offers voyages through the Greek islands. They vary greatly in quality of experience, though it tends to be true that smaller ships provide more personalized attention. One company, the exceptional SeaDream, provides a yacht-like experience. SeaDream is never crowded (there’s a maximum of 115 or so passengers per trip). Forget cramped quarters and buffet lines, the SeaDream is far more relaxed and exclusive. SeaDream’s two identical vessels can be chartered for private use, if the former is not exclusive enough. Perhaps the most famous holiday destination in the whole Mediterranean is Santorini, the postcard image of the Greek islands. The arid landscape, white walls and blue roofs of Santorini are spectacularly beautiful. Dotted with small, atmospheric villages such as Firastina, Imerovigli and Ia (Oia), it attracts a different type of tourist for whom the beach is not a primary concern—the pebbly beaches of Santorini are not as nice as those of neighboring islands like Paros or Naxos. Most people—visitors and locals alike—prefer to sit at a café on cliffs high above the water and admire the expansive view while sipping a strong coffee. The island of Rhodes (Rodos) is the largest of the Dodecanese islands and sits just 11 miles from the Turkish coast. Famous as the site of the Colossus of Rhodes, one of the Seven Wonders of the Ancient World, the medieval atmospheres of Rhodes are still very much in evidence today as viewed by structures such as the Acropolis of Lindos and the Palace of the Grand Master, a reconstruction of a Crusades-era palace that was destroyed in 1856 and reconstructed by the Italians in 1912. The Old City of Rhodes near Mandraki Harbor is one of the most well preserved medieval cities in the world. One of the Saronic islands, Hydra (Idhra) has attracted artists and other creative people for centuries. This charming island less than two hours from Athens is a getaway for the Greek elite when they seek a quiet escape from the bustle of the capital. 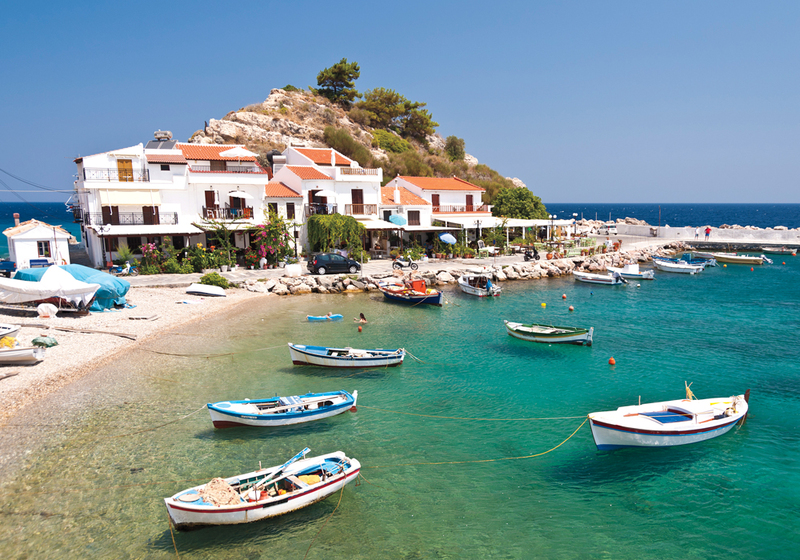 Free of both cars and pretension, Hydra is an ideal location for a taste of island life not far from the country’s capital, though that same proximity allows for boatloads of day trippers during the height of the summer season. Chic guesthouses provide luxurious accommodations with stunning views of the Mediterranean, which remain long after the tourists have gone. 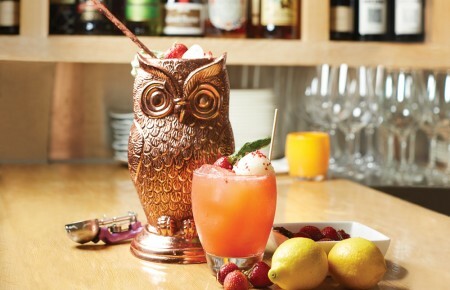 Mykonos is a party city seated in traditional ambience. No conversation about the Greek islands would be complete without a mention of Mykonos. It was one of the first islands to be discovered by mass tourism in the 1970s, and as the hordes of visitors will attest, it is still one of the most popular island destinations in the country. Mykonos, located in the Cyclades group of islands, has been a haven for the avant-garde for decades and has developed a busy nightlife that shows no signs of relenting anytime soon. 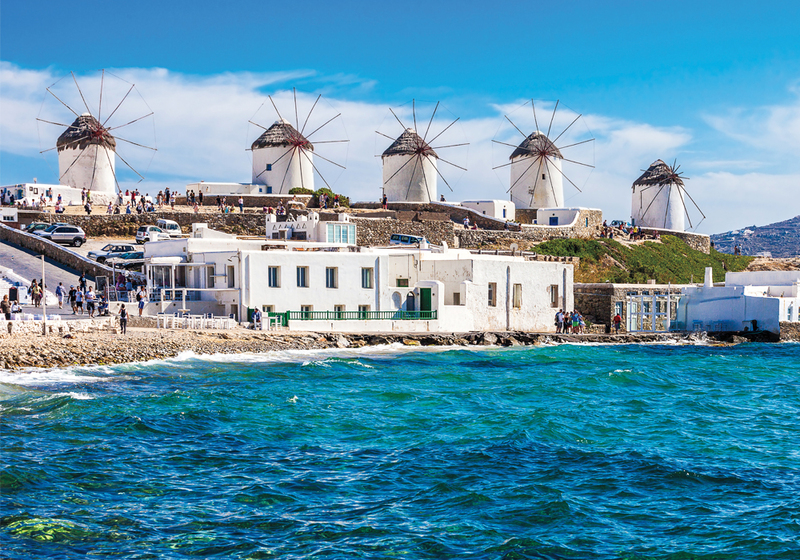 Though the traditional windmills that dot the island imbue it with a unique ambience, most visitors who come to Mykonos are here for the beaches by day and the clubs by night. And if you think Mykonos is brash and noisy until the early hours of the morning, don’t even think about traveling to the island of Ios!